Shuvu Yisrael sect leader in the center of corruption scandal confesses as part of plea bargain. 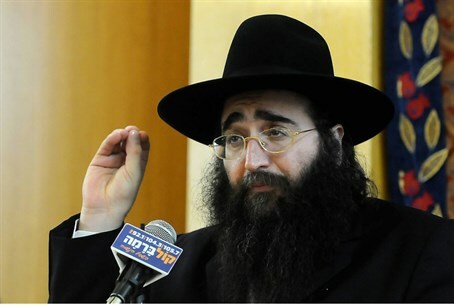 The Tel Aviv District Court convicted Rabbi Yoshiyahu Pinto, head of the Shuvu Yisrael sect, on Tuesday morning, after he confessed to bribery as part of a plea bargain. Pinto arrived for his arraignment early Tuesday and signed a confession according to the terms of the plea bargain; he has been convicted on charges of bribery, attempted bribery and the obstruction of justice. The conviction follows multiple attempts by Pinto and his legal team to prevent him arriving in Israel for the arraignment, and a heart attack scare on Monday that led him to be taken to Ichilov Hospital in Tel Aviv upon landing. Pinto allegedly attempted to bribe senior police officer Ephraim Bracha with $200,000 for information about a pending police investigation into the Hazon Yeshaya charity organization, which Pinto was rumored to be closely involved with. Bracha immediately reported the incident to his superiors, prompting a separate investigation against Rabbi Pinto himself. That investigation revealed that Pinto allegedly tried to bribe several other officers for information about the case against Hazon Yeshaya. The charity, which was supposed to have provided millions of dollars to Holocaust survivors and ran a popular soup kitchen and volunteer network in Jerusalem, closed in 2012 under allegations of fraud. The allegations claim that several members of the charity - including Pinto - stole much of the food donated to the kitchen and sold it for "tens of millions of dollars," according to a 2012 Ha'aretz article. As such, Pinto will also be indicted for other charges, including obstruction of justice and money laundering relating to the case. In addition, Pinto's associates claim that Menashe Arbiv, the former commander of the Lahav 433, received various benefits, including help receiving a visa to the United States for his son and wife. To this end, the rabbi allegedly gave $2,000 to Arbiv's son every month, as well as a 700,000 shekel ($190,000) discount for the senior police officer to buy a home in an exclusive section of northern Tel Aviv. The associates added that the rabbi and his aides also helped Arbiv when he served as a representative of the Israeli Police in the US. Despite admitting to involvement in the crimes, Pinto himself has been highly vocal over his innocence, claiming in hyperbolic statements to his followers that the verdict has "stabbed them with a million knives" and claiming he is "the most persecuted in this generation." The statements were later found to be violations of the plea deal, causing three of his most high-profile attorneys to quit the complex case in October. In addition, he filed a petition through rights group Ometz calling for a criminal investigation into the plaintiff who accused him of the charges.